Vending machines that promote a healthy habit? 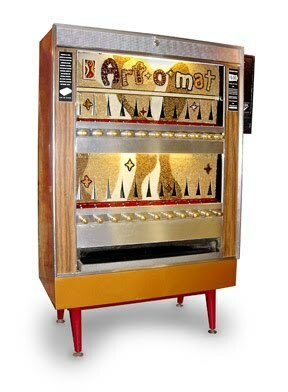 In 1997, North Carolina artist Clark Whittington refurbished a vintage cigarette vending machine; however, instead of using it to dispense cigarettes, he filled it with small items created by local artists. Since then, in an admirable effort to help increase the accessibility of art, Whittington has set up 99 Art-o- mat machines throughout the country. The machines, housed in museums, art galleries, bars, and Whole Foods Market stores, among other spots, vend $5 mini-works of art. For additional information, check out this video clip, or visit Artomat.org. The Art-o-mat folks are on the lookout for new artists to participate. If you or someone you know is interested, read the artist guidelines here. That’s my Houston Whole Foods Art-o-mat there. When I visit the store, I check out the available art selections. Love them.